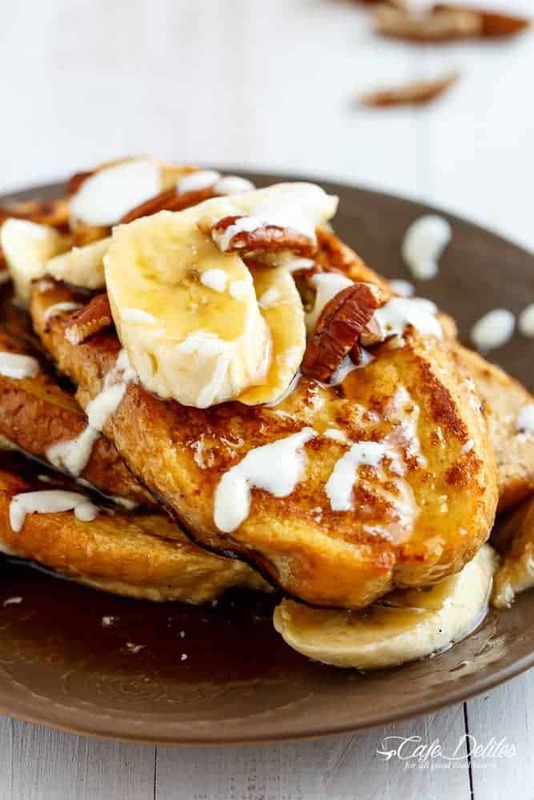 A cheats way of having Banana Bread without actually having any banana bread; making it into a french toast; drizzling it with a Cream Cheese glaze, and loving your life. How does one turn a humble piece of boring old bread into banana bread without any effort, you may ask? Here’s how! How? This is an old recipe. Like, old. The first time I cheated on banana bread was last year. I posted this recipe up to my Instagram page, and it went psycho loco for months afterwards. Besides the fact we were craving it hard this morning, I took advantage of making it for the millionth time — made it even easier and better, and recreated it for the blog. First. Blend a banana with the usual french toast ingredients of egg and milk in your magic bullet (large cup) OR a normal blender. 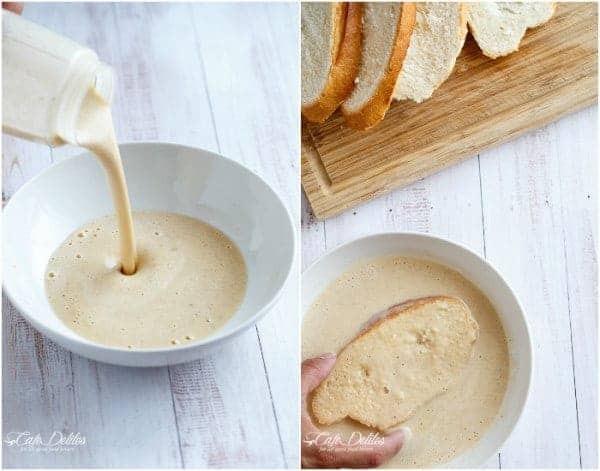 It turns into a nice, thick and creamy ‘batter’ to coat your bread in. Dip. Coat. Fry. Try one without passing out. No, seriously, that’s it. 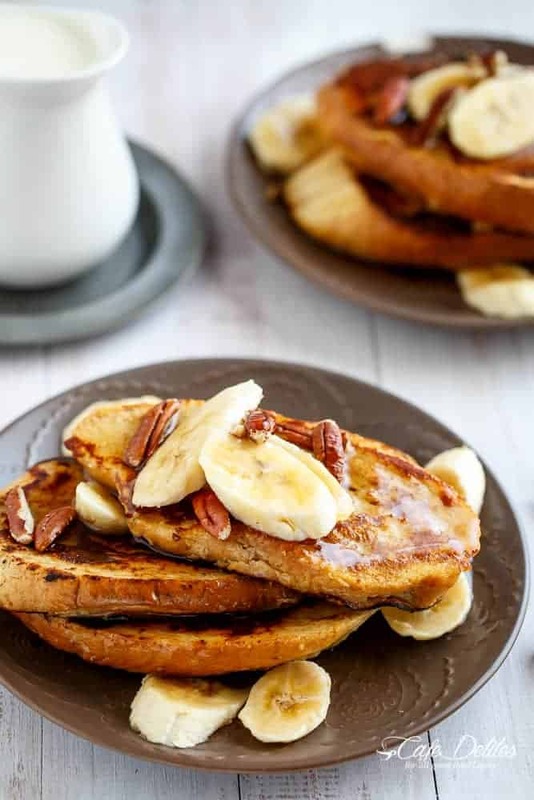 No need to go out of your way to make any banana bread, wait for it to go stale, to make it into french toast. There’s. No. Time. For. That. And go on the best mind-blown ride of your life. 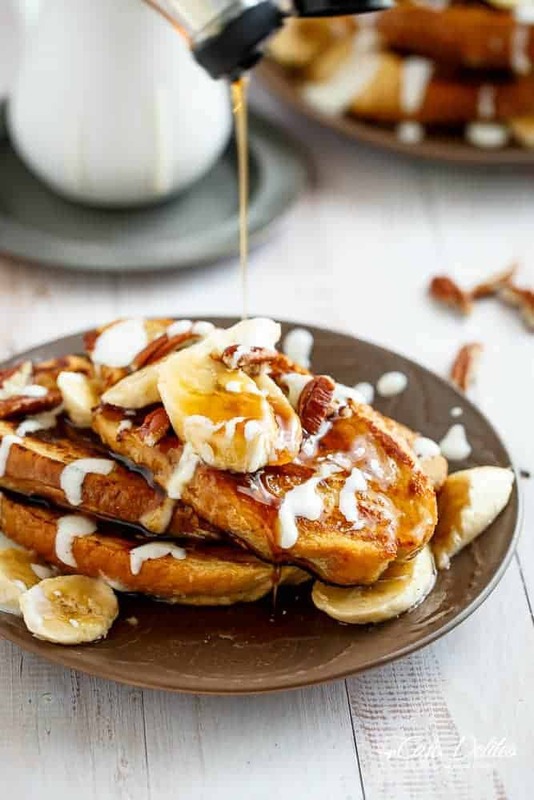 A Banana Bread French Toast drizzled with a Cream Cheese Glaze! 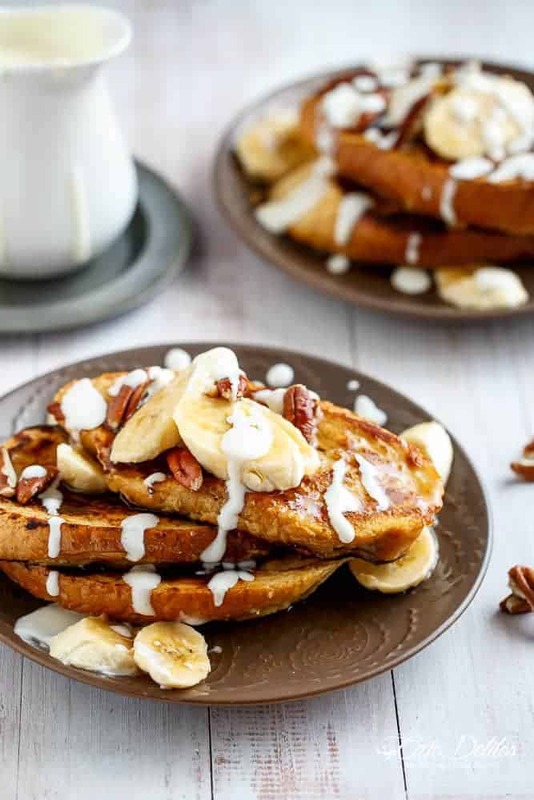 Blend all of the French Toast ingredients in your <a href="http://www.amazon.com/gp/search/ref=as_li_qf_sp_sr_tl?ie=UTF8&camp=1789&creative=9325&index=aps&keywords=Magic%20bullet&linkCode=ur2&tag=cafedeli-20&linkId=BDJUKEQYMEDW57GM" data-mce-href="http://www.amazon.com/gp/search/ref=as_li_qf_sp_sr_tl?ie=UTF8&camp=1789&creative=9325&index=aps&keywords=Magic%20bullet&linkCode=ur2&tag=cafedeli-20&linkId=BDJUKEQYMEDW57GM">magic bullet large cup</a> OR a <a href="http://www.amazon.com/gp/search/ref=as_li_qf_sp_sr_tl?ie=UTF8&camp=1789&creative=9325&index=aps&keywords=Blender&linkCode=ur2&tag=cafedeli-20&linkId=HD6C3RL3ZNJ5DDBD" data-mce-href="http://www.amazon.com/gp/search/ref=as_li_qf_sp_sr_tl?ie=UTF8&camp=1789&creative=9325&index=aps&keywords=Blender&linkCode=ur2&tag=cafedeli-20&linkId=HD6C3RL3ZNJ5DDBD">normal blender</a>. 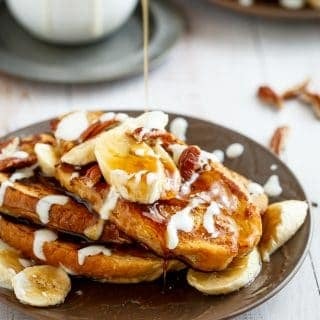 Alternatively, mash the banana with a fork, then whisk the egg, milk, sweetener/sugar, cinnamon and vanilla into it to combine really well (it's ok to have a few banana lumps in the mix). Coat bread evenly in the egg wash.
Heat a pan with butter or cooking oil spray; fry soaked bread on low heat on both sides until golden and browned, flipping gently to turn. Combine all of the glaze ingredients together in a bowl; use a hand beater to whip until smooth. This looks divine. I think this would be especially good with banana sprinkled with cinnamon, pan-seared, and served on top! I’m also obsessed with maple, so it would be hard to stop me from using maple syrup in the cream cheese glaze instead of sugar (even though it would take away from that beautiful thickness somewhat). Thanks for the recipe! I think Im in heaven!! This recipe is incredible! !